Autographed animation art for your non-profit fundraiser! Autographed animated art can be perfect for your non-profit’s next fundraiser auction for any fundraising event, for school events, and for children’s charities. Animation has been the hallmark of childhood for many generations. We all grew up loving our favorite animated characters. These characters personify for each of us a piece of our childhood. 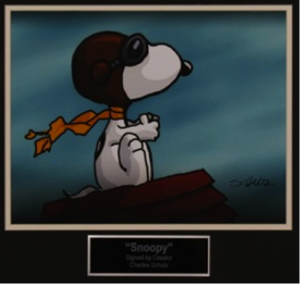 A framed “Snoopy” signed by creator Charles Schulz is more than an image with writing on it. To some of us, it is the summation of countless lazy Sunday afternoons spent with our noses stuck in the newspaper comics. The image symbolizes the adventures we took, the stories we were told, and the jokes that were cracked and shared with snoopy and his friends. Having autographed animated art items in your auction fundraiser can reach your audience. After all, we were all kids at a time; we all still have that kid inside of us. Bringing autographed animated art to school-related events and fundraisers could not be more perfect. The season of life full of animation that captures the heart of youth, imagination, and fun. 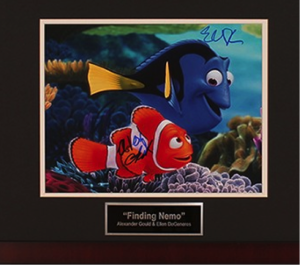 Over the years, many families have spent quality time watching “Finding Nemo.” What family wouldn’t want to have moments of their time together commemorated in an autographed animated artwork? Many seasoned advisers recommend making the theme of your fundraising auction items around the cause you are raising money for. Autographed animated art is a perfect fit for any children’s charity. Keeping the spirit of childhood: innocence, fun, imagination, adventure, and hope – brings your invited guests back to the purpose of why they are there – to help your charity focused on helping kids. Consequently, every auction item will serve as a reminder and symbol to the winning bidder.